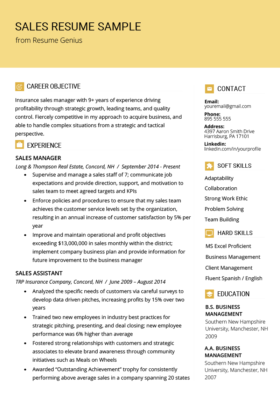 For a career in sales, you’ll need a cover letter that upsells your unique skills. 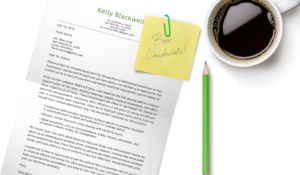 The cover letter samples below will do all the selling for you. 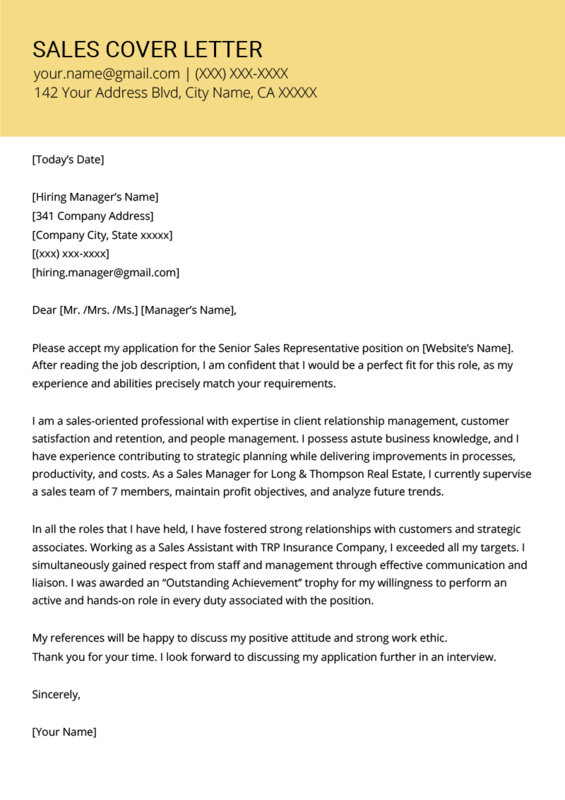 Please accept my application for the Senior Sales Representative position on [Website’s Name]. After reading the job description, I am confident that I would be a perfect fit for this role, as my experience and abilities precisely match your requirements. I am a sales-oriented professional with expertise in client relationship management, customer satisfaction and retention, and people management. I possess astute business knowledge, and I have experience contributing to strategic planning while delivering improvements in processes, productivity, and costs. As a Sales Manager for Long & Thompson Real Estate, I currently supervise a sales team of 7 members, maintain profit objectives, and analyze future trends. In all the roles that I have held, I have fostered strong relationships with customers and strategic associates. Working as a Sales Assistant with TRP Insurance Company, I exceeded all my targets. I simultaneously gained respect from staff and management through effective communication and liaison. I was awarded an “Outstanding Achievement’’ trophy for my willingness to perform an active and hands-on role in every duty associated with the position. My references will be happy to discuss my positive attitude and strong work ethic. Thank you for your time. I look forward to discussing my application further in an interview.